A securely tied anchor rope puts a boater's mind at ease. When tying your anchor rope to your anchor chain, it is crucial to have a strong knot that you can trust. Fortunately, the anchor hitch is easy to tie and designed to keep your boat securely tethered to your anchor. 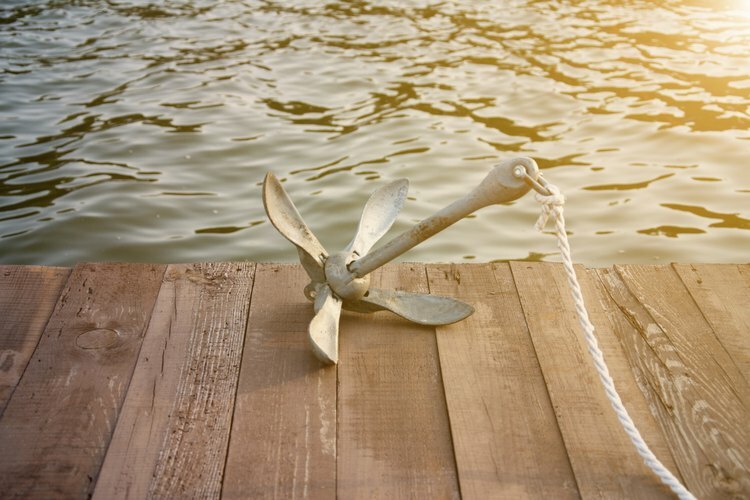 The anchor hitch is an ideal way to tie your anchor rope to the anchor. It does not loosen when tension on the line changes, which will happen often when the boat rocks or the current changes. First, bring the rope towards you and pass it through the anchor chain. Repeat, passing the rope through the anchor chain on the left of the first pass. You should have two coils of rope through the anchor chain. Take the end of the rope and bring it right so that it is between you and the chain. Now put the end of the rope through the coils from right to left and pull tight. The rope end should trap the standing line that goes to your boat. To finish the anchor hitch, take the end of the rope and pass it from left to right around the standing line so that it forms a loop. Put the end through the loop and pull tight. This is a half-hitch. Repeat one more time to make a double half-hitch. This will prevent the anchor hitch from slipping. Based in Asheville, N.C., Felix Dowsley has worked as a outdoor deucator since 2008. He has also worked as a Physical Education teacher. Dowsley holds a Bachelor of Arts in English and religious studies from Washington University.